Eoghan is a holder of a UEFA “B” license and he is an NCEF qualified fitness instructor. Shooting Stars Soccer School was established by Eoghan O’ Meara, a former league of Ireland player in the hopes of providing young players of all abilities with the opportunity to learn and enjoy soccer in a professional and structured coaching environment. 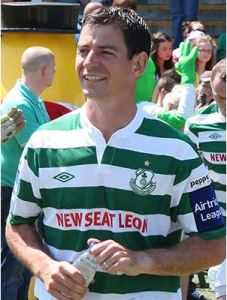 Eoghan O’Meara has a long background in soccer having played League of Ireland football for many years with Shamrock Rovers, Monaghan United and Kildare County. Eoghan has also plenty of experience in coaching having set up and coached on soccer camps for 6 to 18 year old boys and girls in the U.S and coaching men & womens high school teams in the U.S. At home Eoghan has coached and thought P.E at Secondary and Primary Schools in Kildare and Dublin and has coached the womens soccer team at National University of Ireland Maynooth. Eoghan has also taken up the position of Academy Coach at Shamrock Rovers Football Club.